Citrix XenApp and XenDesktop play leading roles in the healthcare IT virtualization revolution, and it might be assumed that consolidating user computing with these advanced technologies automatically delivers simplified management and cost savings. But the reality is that without sufficient preparation and understanding of the expanded set of variables – within the Citrix stack and across the entire infrastructure – operational benefits can be quickly offset by inconsistent application performance for your end users. 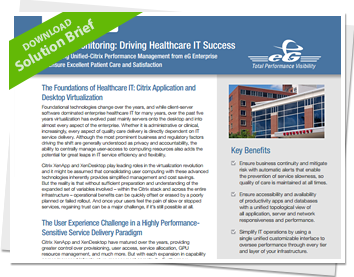 Automated, unified performance management helps ensure successful IT rollouts, excellent user experience and ultimately, quality care and patient satisfaction. Beyond analyzing performance data from multiple siloed tools, eG Enterprise makes identifying problem components and services as simple as glancing at a dashboard, visual topology or e-mailed alert. eG Enterprise’s intelligent diagnosis capabilities provide exactly the actionable intelligence that healthcare IT departments need to fix issues before users notice a problem. In a single console, eG Enterprise provides the combined benefits of end-to-end infrastructure monitoring and true APM. 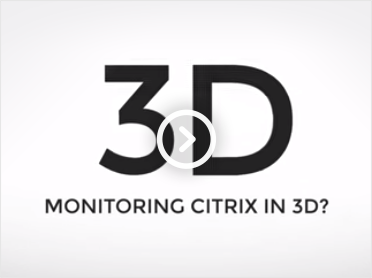 Healthcare IT professionals can greatly benefit from the industry’s only 3-dimensional performance monitoring coverage: Reach across every – tier, network, storage, virtualization, Citrix, Windows and more; Depth of coverage – putting the metrics that matter at your fingertips; and, Speed to resolution – helping you to detect and fix issues in minutes, instead of hours. Ensure continuity and mitigate risk with automatic alerts that enable the prevention of service slowness, so quality of care is maintained at all times. Ensure accessibility and availability of productivity apps and databases with a unified topological view of all application, server and network responsiveness and performance. Simplify IT operations by using a single unified customizable interface to oversee performance through every tier and layer of your infrastructure. Drive successful new deployments across the enterprise using comprehensive analytics and reporting for all stakeholders, from executive to managers and administrators. Extensive reporting to drive critical technical and business requirements, including user access verification, workload balancing, right-sizing for maximum server density, and more. 100% web-based and mobile-friendly solution, with easy setup and automatic baselining for applications running on any infrastructure including public and private clouds.